The Liberal Party a broad church? Maybe not. – Thoughts on politics, policy and parties. Last Friday, in an article in the Australian Financial Review, journalist Andrew Clark described the centre-right Liberal Party as a broad church. He is not the first to do so. Former Liberal Prime Minister John Howard used the phrase many times to describe the party he led,*and a number of commentators have also used it (for instance, here and here) and other politicians (such as current Attorney-General George Brandis in his 2009 Alfred Deakin Lecture**). However, looking at the issue preferences of the Coalition’s candidates compared to those of the Labor Party indicates there’s not a lot of evidence for the claim. Using an item response theory model (the same type of model described here) fit to surveys conducted on federal election candidates in eight of the nine elections held between 1987 and 2010, we can examine the issue preferences of Coalition and Labor candidates. 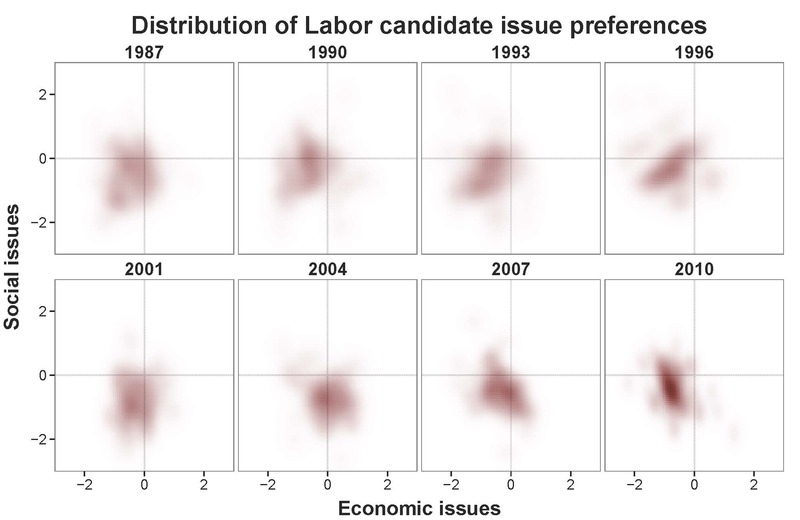 Each plot shows the distribution of economic (horizontal axis) and social (vertical axis) issue preferences of both parties’ candidates in each of the eight surveys. Each point represents a seperate surveyed candidate. Issue preferences are measured on a left-right spectrum standardised to have a mean of 0 and variance of 1. The higher the scored preference, the further to the right the candidate is (so a candidate with a score of +1 is 1 standard deviation to the right of centre). 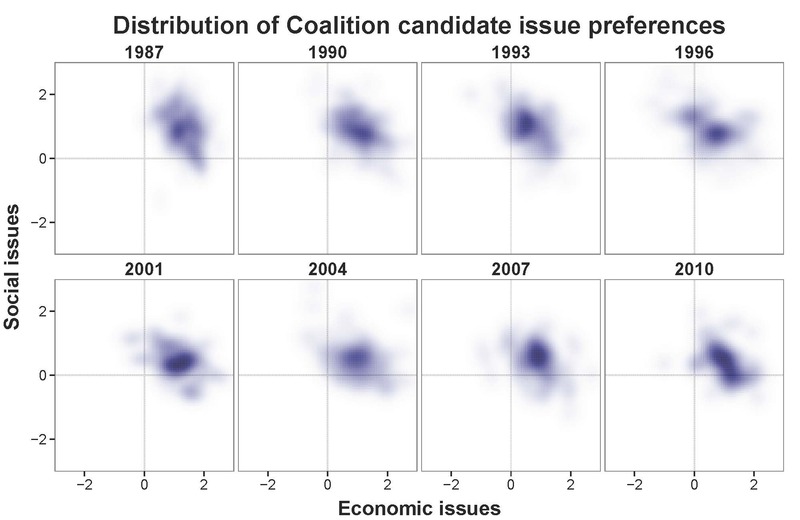 Examining these plots, we can see that Coalition candidates are overwhelming located to the right of centre on both social and economic issues. Labor candidates are also generally to the left of centre, but their preferences are no less distributed than the Coalition candidates on economic issues and far more diverse on social issues. This suggests the Labor Party attracts candidates with a wider variety of views on social issues than the Coalition, and similarly constrained views on economic issues. To be more specific, in the surveys in which Coalition preferences diverged the most on economic issues (2004) and the least (1987), the variance of their preferences were .78 and .49 respectively (with the electorate as a whole having a variance of 1), compared to Labor’s highs and lows of .71 and .5 each. On social issues the difference is even larger, with the higher and low variance for the Coalition being .63 (1987) and .5 (2001) compared with .73 (1993) and .59 (2010) for Labor. That is, the Coalition is no more the home of representatives with a diverse range of views than is the Labor Party (at least according to these data). In fact, it appears to be a more constrained ideological movement than its opponents. The Liberal Party a broad church? Maybe not. *Without a hint of self-interest, I am sure. ** I was going to link to this, as it was previously hosted by The Australia, but for some reason they’ve pulled it in the last few months. Maybe they have a completely different definition of ‘church’ than us common folk do. Fascinating read, thanks! I’d say any claim by a party leader about their own party (that it’s a broad church, that it’s the better economic manager) needs to be taken with a grain of salt. These data, whilst not the final word on the matter, should make us pause and wonder whether the Liberal Party (or actually the Coalition) is a broad liberal movement, or a conservative political force. Quite so. I alluded to the point in one of my previous posts that the division between the ‘wets’ and the ‘drys’ seems to be evolving into something similar to the factions within the Labor party. In the long-run, the wets would know that breaking off and forming their own party would be political suicide (e.g. 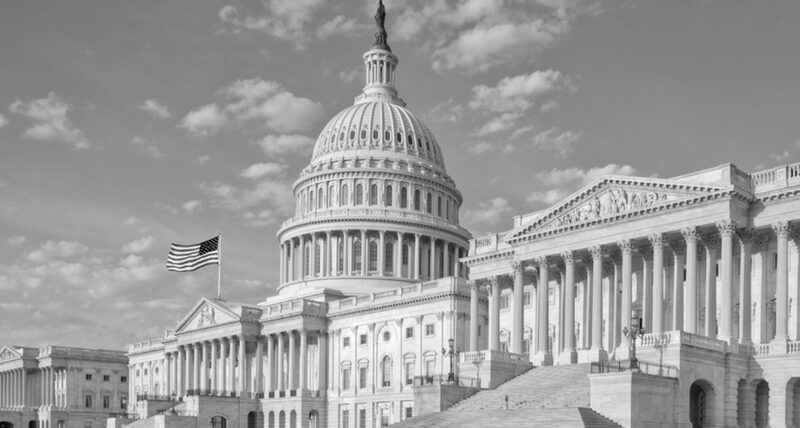 The Democrats), but tolerating such a strong conservative faction might tarnish them electorally in the future – interesting times ahead indeed. I read your post. It was interesting. However, I’m not sure you could classify Malcolm Turnbull or other Liberal moderates as Wets, as the term was used in the 1980s. On economic matters they are closer to the Dries. What differentiates them from the conservatives of the party is mostly social issues (immigration, gay marriage, abortion) and climate change. The moderates and conservatives often have similar positions on economic matters, and not infrequently the moderates are actually further to the right on these issues (many are small ‘l’ Liberals, believing in smaller government socially and economically). It would be interesting to see the views of the current front bench siphoned through something like the Nolan Chart (as above) – it might explain the current internal rumblings. Anywho, thanks for the feedback, always appreciated. I look forward to your next post!